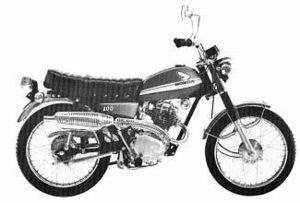 The Honda CL100 was a 4-stroke single cylinder street motorcycle sold by American Honda Co in the U.S. in the early 1970s. The CL designation indicated this model to be the "Scrambler" version which implied some off-road capability. 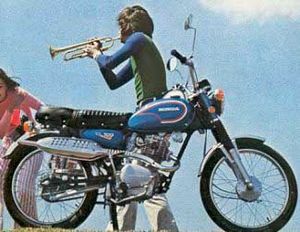 (This was before real dirt-bikes were gaining popularity.) It was really just a street bike with a higher rear fender, a braced handlebar, and a high-mount exhaust. 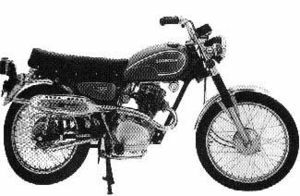 The CL100 was a full-featured motorcycle with a 100 cc 4 stroke engine 5-speed transmission with manual clutch, high mount exhaust with chrome heat-shield, full electrical system, including headlight (hi/lo beam), taillight, brakelight, turn-signals, horn, speedometer with neutral light, high-beam indicator, and odometer. The 100 cc engine produced 11.5 HP according to Honda. This was sufficient to propel the bike with a small rider to about 70 mph. The CL100 was also available in a model designated CL100S, which had a governer to reduce power to 5 HP to meet some state restrictions for younger operators. In this configuration, top speed was about 50 mph. 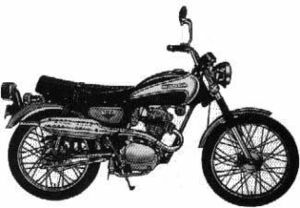 The Honda Scrambler CL100K0 was sold in 1970. Three colors were available: Candy Sapphire Blue, Candy Ruby Red, and Candy Topaz Orange. The fuel tank had a white stripe. The exhaust pipe had a 2-piece heat shield. The upper fork cover and headlight shell were painted one of the basic colors. The fenders and exhaust system were chrome. The engine was a single cylinder 99cc OHC with a 5-speed transmission. The serial number began CL100-100001. 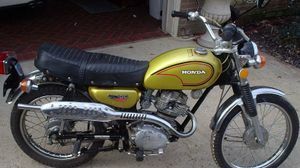 The Honda Scrambler CL100K1 was sold in 1971. Three colors were available: Candy Sapphire Blue, Candy Topaz Orange, and Poppy Yellow Metallic. The fuel tank on the blue and orange units had white stripes; but on the yellow bike the stripes were black. The exhaust system had a one piece heat shield. The "CL100" side cover emblem was molded plastic. The upper fork cover and headlight shell were painted one of the basic colors. The fenders and exhaust system were chrome. The engine was a single cylinder 99cc OHC with a 5-speed transmission. The serial number began CL100-200001. The CL100S0 Scrambler 100S was sold in 1971. It was identical to the CL100K1 except the side cover emblem reads "CL100S". The engine was a detuned version of the CL100K1. The serial number began CL100S-100001. 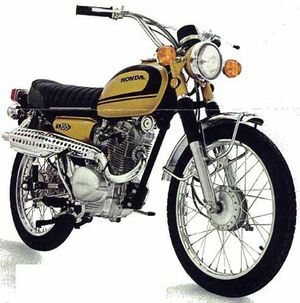 The CL100K2 Scrambler 100 was sold in 1972. It came in one of two colors: Candy Yellow or Hawaiian Blue Metallic. The gas tank stripes were white and red. The triangular side cover emblem was red. The upper forks and headlight shell were chrome. The serial number began CL100-1200001. The CL100S2 Scrambler 100S was sold in 1972. It was identical to the CL100K2 except the side cover emblem reads "CL100S". The engine was a detuned version of the CL100K2. The serial number began CL100S-1200001. 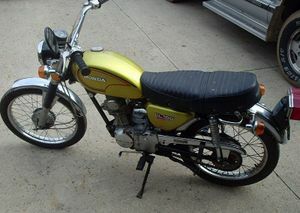 The CL100S3 Scrambler 100S was sold in 1973. It came in two available colors: Candy Ruby Red or Hawaiian Blue Metallic. The side cover emblem reads "100S". The gas tank stripe was white. The exhaust system was black with a chrome heat shield. 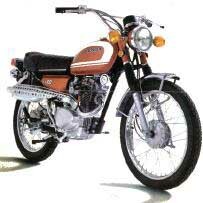 The graphics on the tank were similar to the CL125S0. The serial number began CL100S-1300001.